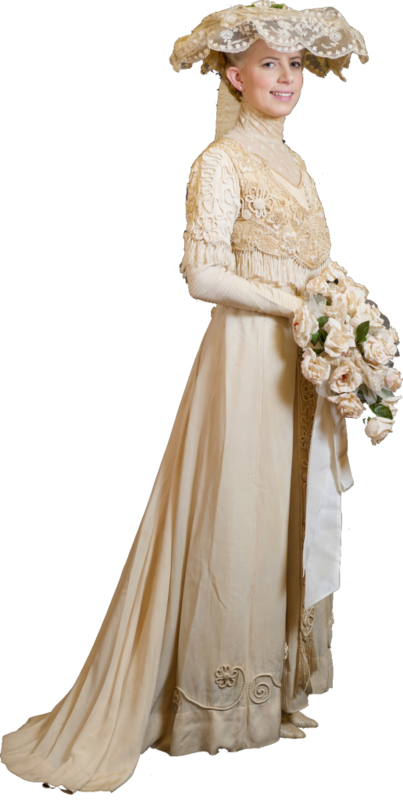 Daisy’s elegant two piece wedding gown has a high waisted cream silk skirt, with an elaborately scrolled centre front panel and a slight train at the back. The bodice, fringed along the lower edge, has long sleeves and a high Edwardian neckline, inset with embroidered net. Her wonderful hat is very typical of the large extravagant creations worn on the head during the Edwardian era. Daisy, born in 1873 in Ashfield, Sydney, was the daughter of Dr Edwin Chisholm, a Darlinghurst practitioner. Daisy had a liberal upbringing. Her father was a remarkable man and the antithesis of a Victorian father. His children adored him. Daisy was born with her fare share of charm and as her father’s favourite was much indulged. She was an avant-garde women’s libber, while still remaining totally feminine. Daisy started smoking at the age of 12, and died still smoking aged 92, and to her dying day attracted men like bees to a honey pot.